Loan defender George Cox could be poised to make his return to the Cobblers first team squad for Saturday’s Sky Bet League Two clash with Mansfield Town at the PTS Academy Stadium (ko 3pm). The 21-year-old hasn’t played since damaging ankle ligaments in the 3-2 defeat at Cambridge United back on January 19, in what was only his second appearance for Town having joined until the end of the season from Premier League Brighton & Hove Albion. The left-back has been back with the Seagulls undergoing rehabilitation since suffering the injury at the Abbey Stadium, but this week rejoined the Cobblers squad for training, and manager Keith Curle is hopeful he could be available to play a part against the Stags. 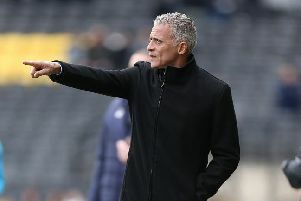 “George has rejoined us now from Brighton, and has been doing his field-based rehabilitation,” said Curle, who made Cox his first signing as Cobblers boss. “He came up on Monday and had a physical fitness test out on the pitch to make sure he is at the level he was when he first joined us. Another player that Curle is hoping will be back and available to face promotion-chasing Mansfield is midfielder Shaun McWilliams. 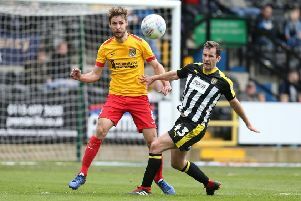 The 20-year-old missed the weekend trip to Notts County after suffering a recurrence of a hamstring strain, but the Cobblers boss is keeping his fingers crossed McWilliams has finally shrugged off the issue. “Shaun is still on field-based rehabilitation, and has been doing more fitness work,” said Curle ahead of training on Tuesday. “He had a slight aggravation to his hamstring, but again we are hoping he will be able to train fully by the end of this week. If Cox and McWilliams are made available for the weekend, it means Curle will have a full-strength squad to pick from against the second-placed Stags.